Either through accident or long-term dental health issues a patient may be left with few healthy teeth or none at all. In such cases, a dentist or prosthodontist may recommend a complete replacement of teeth and gums using dentures. Dentures come in two types - complete or partial. 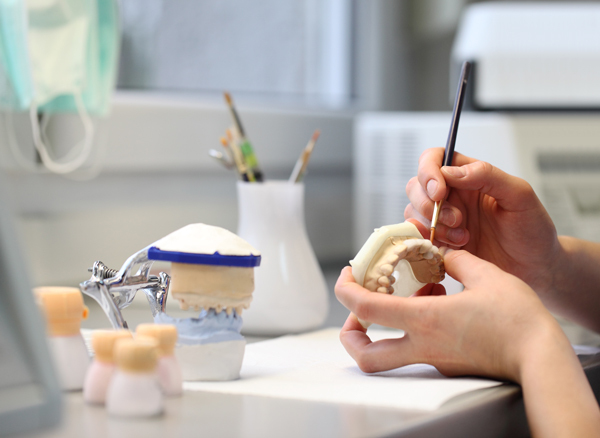 The process starts by taking customized model of your teeth by taking impressions. If you need help with your dentures, Sherwood Park has local specialists including Bennett Dental who can inform you of your options as well as provide services. A complete denture has casually been referred to as 'false teeth'. These are a complete set of artificial teeth and gums that are used as replacement when all natural teeth are missing. They come in two forms, immediate and conventional dentures, and will take time to get used to, but with time you will be able to eat in a normal fashion, though certain sticky or hard foods will remain a problem. Just as there name describes, they are used when only a few teeth are missing or when nearby teeth are not strong enough to hold a bridge. Partial dentures are comprised of one of more teeth that are secured in place by clasps that secure to adjacent teeth. It is easy for you to remove partial dentures yourself - for cleaning purposes or sleeping. Prior to the removal of your teeth, immediate dentures are constructed. The process involves your measurements and modelling of your jaw. Once your teeth are extracted, your immediate dentures are inserted in-place. Immediate dentures give you the advantage of not going without teeth during the healing period - which can take up to 6 months. Conventional dentures are a full removable denture that is are created and palced into your mouth after your teeth have been extracted and the gums and jaw tissues have fully healed. In some cases, for patients who have either partial or complete teeth loss, overdentures may be preferred. They are a form of removable dentures which can fit overtop of existing teeth or dental implants. If there are natural teeth, they can be reshaped to fit into the denture. If there are no teeth (fully edentulous), small dental implants are secured into the jawbone. The overdenture can then rest atop of the natural teeth and/or implants. Your dentures need to be cleaned and taken care of just like regular teeth. In fact, they are susceptible to plaque and tartar which can accumulate and cause stains, odour, impact gum health and spread issues to your natural teeth. At our Sherwood Park dentist office, we will provide you with information on how to take care of your dentures, including daily cleaning. Cleaning involves removing the dentures, and rinsing them under warm water to remove loose food particles. A wet denture brush or regular toothbrush with a bit of denture cleaner or mild soap is used instead of toothpaste - which is too abrasive and will cause damage over time. Careful brushing off the surface and underneath the clasps is essential as these are key areas for bacteria to collect. The dentures should then be rinsed in clean water before being placed back in the your mouth. With your dentures removed, it is an opportunity to clean and massage your gums. You can use your toothbrush and it can help to run it under warm water to make it softer. Alternatively, a finger wrapped in a clean, cloth that is wet with water can also work. Partial dentures can be brushed alongside your natural teeth with a regular soft-bristled toothbrush followed by flossing and then rinsing. It is important that your dentures are removed each night, as you will need to allow you mouth to rest and restore. Overnight and anytime you are not wearing your dentures make sure that they are soaked in warm water (important: never use hot water for soaking). You may also add some denture cleaner to the water unless your dentures use metal clasps, in which case you should only use warm water to prevent tarnishing. Be careful not to drop your dentures as they are fragile. We recommend that you have a soft material, such as thick towel, beneath you and on your sink area in case they fall. Dentures can be repaired in some cases, but best to avoid costly repairs or having to have a new replacement made. Inspect your dentures periodically to ensure that there are no cracks or loose components. Let your dentist know immediately if there are any issues. It is natural that your denture may need some realigning or adjustment as overtime our mouths change slightly in shape. It is important that your denture is adjusted to fit, otherwise it may cause sores which can obscure detection of oral cancer - should such case arise. With regular visits to our Sherwood Park dentistry, we will do our part to examine gums and check for signs of disease, oral cancer, gum issues and natural teeth decay or infections.